mezinárodní veřejná soutěž Praha - Letná 2006 The building is stepped back from the main street to create a large public space in front of the main entrance. This court is partly sunken into the terrain in order to create a calmed atmosphere protected from traffic noise, dust and additionally, on the opposite side of the plot, in order to achieve a compelling connection to the park in the form of an artificially landscaped beach. The building’s main volume is elevated some 13m above the open, free parterre below where it covers public functions such as main entrance objects, shops, restaurants, cafeterias and extensive external seating, dining and performance areas. The square forming the building’s footprint has been adjusted to a size of exactly 93x93m, representing the founding year in the modern European history of the new Czech Republic. Gently undulating facades of convex, concave and float glass correspond not only with the structural system but essentially with the spaces and functions behind them, together creating a light, weightless appearance for the building. The vision of a floating cushioned entity in Letna Park is considered a formidable part of several such landmark buildings supporting Prague’s existing fabric and panorama. The heavy and bearing element of the building is signified by the central safe deposit block containing the library’s main collection and information resources. To this, a light weight mega space frame slowly meanders around this pragmatically organised warehouse and forms a structured honeycomb. The cellular system adapts to serve all activities and services defined within the competition programme. 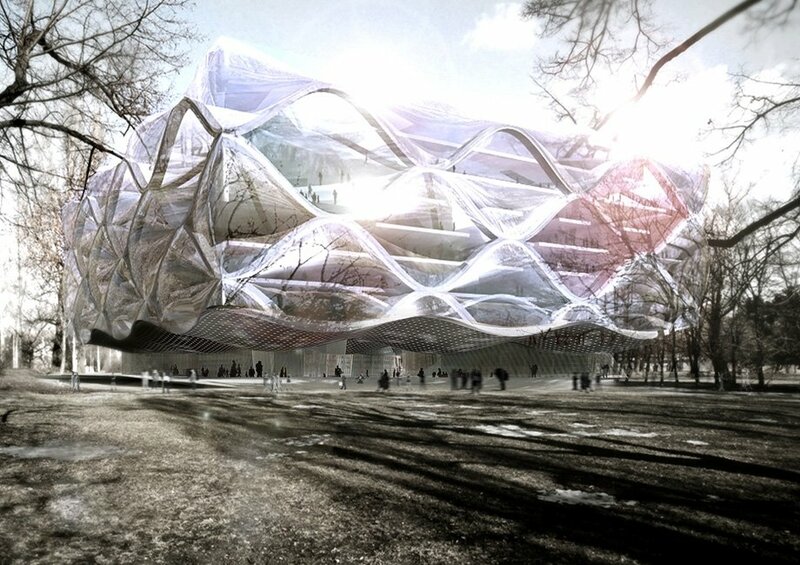 The potential of merging, twisting, skewing and rotating the cells is used to create a unique spatial experience. Accordingly, the building offers an ideal environment for both main components: The Software (readers) require a high degree of environmental diversity suiting individual reading, studying or educational processes. The Hardware (information) is stored, maintained and protected on a flexible, open uniform grid framework, enveloped by a communication perimeter containing lifts, stairs, escalators and light wells to transport this information. Literally the hardware microchip stored inside the building is brought into life through the software bytes oscillating behind the facades.